It’s time again for football fans to get excited to come together for the biggest event of the season, as Super Bowl XLIX waits just around the corner! This year, the Fine Art Studio of Rotblatt-Amrany is proud to be a part of the festivities at the renowned University of Phoenix Stadium, where the studio’s monument to distinguished Arizona Cardinals safety and Army Ranger Pat Tillman awaits fans for a historic day of celebration and remembrance. Opened in 2006 and host to such past events as Super Bowl XLII, Wrestlemania XXVI, and numerous Fiesta Bowls, the 63,400-seat University of Phoenix Stadium is itself a monument to the modern sports arena, a celebrated marvel of architecture that employs a retractable roof, a natural roll-in grass playing surface, and state-of-the-art display systems. These features, among many others that showcase a dedication to ultra-modern facilities and artful architectural planning, have helped to earn the University of Phoenix Stadium recognition among the most lauded arenas in the world, and even praise from publications like Business Week. 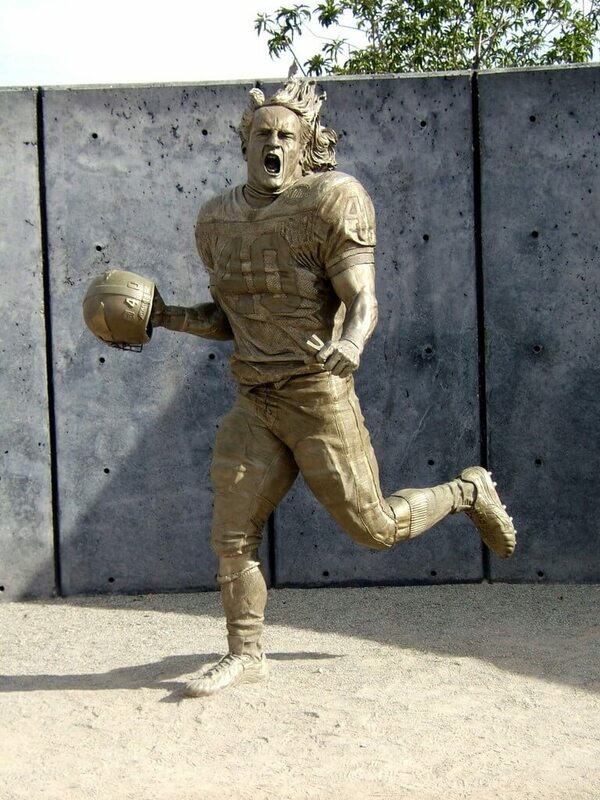 For all these reasons, the Fine Art Studio of Rotblatt-Amrany is more than pleased to showcase a work of tribute to standout Cardinals defensive player and outspoken American serviceman and Former Arizona Cardinals safety Pat Tillman, installed permanently at the University of Phoenix Stadium in 2007. Capturing a powerful moment in time on the playing field, the life-sized work in bronze and stone, created by artists Omri Amrany and Gary Tillery in collaboration with architect Peter Eisenman, effectively expresses the insurmountable spirit that not only defined Pat Tillman, but which inspires new players to greatness and fans to celebration. In May of 2002, after three exemplary seasons with the Cardinals, 1997 Pacific-12 Defensive Player of the Year Pat Tillman turned down a lucrative three-year contract to enlist in the United States military, compelled by the events of September 11, 2001. Distinguishing himself again as an Army Ranger, Tillman’s life was tragically cut short by friendly fire on April 22, 2004, while on duty in Afghanistan. In the time since his death, Pat’s indomitably independent spirit, his willingness to serve others as an integral team player, and his unflinching intellectual courage have been memorialized time and again by those who knew him, on the field and off. Through a life of service and dedication, Pat Tillman left a legacy inarguably worth remembering, and The Fine Art Studio of Rotblatt-Amrany is honored to contribute both to his legacy and to the history of great football players. This Super Bowl weekend, The Fine Art Studio of Rotblatt-Amrany invites you to explore Pat Tillman’s powerful story, and those of the many other commendable sports figures that keep fans coming back to cheer! Surely, there’s no better time. Enjoy the game!